in a sugar cane field on the way from Kahului to Kihei. A is for Aloha… This is a 26 day series for the month of April as part of the A to Z Blogging Challenge. A post a day for each letter of the alphabet, with Sundays off for good behavior. when we see or hear the words Hawaii or Maui. Wikipedia calls these symbols leitmotifs. Aloha is a much bandied about word in Hawaii. Aloha means hello, goodbye, love, compassion. It’s the basis for the “Aloha Spirit,” the idea of being kind and loving, of sharing and giving, even to total strangers. A bird graffiti I spotted. "Aloha to face the breath of life (ha - breath of life)." This is a deeper meaning of aloha. Aloha Fridays refer to Friday being the last day of the work week and a more casual day. A popular song goes, “It’s Aloha Friday… no work till Monday…” Often men wear Aloha shirts on Aloha Friday, even if they have to dress more formally on other days. They also wear Aloha shirts on other days of the week, at more casual offices. At luaus and public gatherings, a speaker or host will greet everyone with a loud and booming “Aloooooooooooooha!” Some native Hawaiians think this isn’t a good pronunciation of aloha with the long "o." But it's the norm at these types of events. 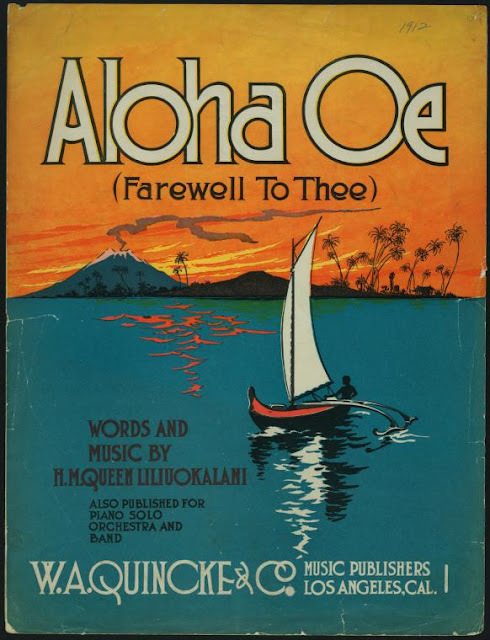 Aloha Oe Sheet Music, vintage illustration from the NY Public Library. While Aloha can mean hello, I rarely greet close friends with a big “Aloha.” I tend to use aloha in more formal situations, like at work. Depending on who I’m with… and the situation, sometimes "Aloha" feels right, sometimes "Hello" is better. Aloha is also the beginning of a classic Hawaiian song, Aloha Oe, which means "Farewell to You." According to Hawaiian practitioner Serge King, aloha stands for much more than just "hello" or "goodbye" or "love." Its deeper meaning is "the joyful (oha) sharing (alo) of life energy (ha) in the present (alo)." Hawaiian is a pretty complex language and each word has meanings within meanings. Serge King says that Aloha is a powerful word and can be used to create good in the world. He has created a free life-enhancing technique based on the Aloha Spirit. Update 6/1/13: Came across this powerful post on Aloha, and its deeper meaning. Update 2/11/15: Kahu Lyons Naone talked about aloha during a lecture about Hawaiian herbal teas, which really turned into a talk about Hawaiian culture. "Alo – face, look at each other in the eye and share breath, aloha. Face each other and share. At that moment this person and I receive a spiritual breath at the same time." Wonderful idea! I've done A to Z in the past...doing my own "beauty venture" right now and barely keeping up. It's a great way to network with other bloggers, though! Mahalo Toby. I enjoyed your post on water textures too. Good luck with your beauty venture! Fun Blog! I can't wait to read more! Glad I found you on the blog hop! Mahalo! I'd love to find who you are. If you see this, please send me your blog link. A popular sign off here at VIE on #Maui is "Aloha Nui Loa". Great examples of how we spread #Aloha in popular culture! Yes, it's good to keep the visual reminders up! I love this idea! 26 thorough posts exploring our island from A to Z. What a great start. Keep em coming and ALOHA! When I first got here a Kapuna explained aloha as A fas in ahh or the joy and amazement of life. Lo for you and me and love. And ha for breath. I have also heard it described as sharing or giving of breath to each other to be cherished.